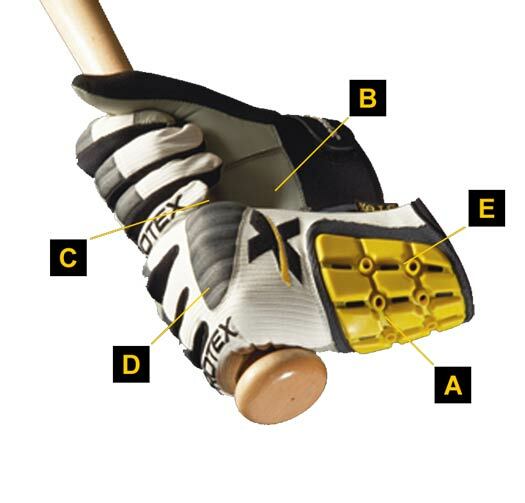 The Xprotex Dingr is a lightweight protective batting glove with greater mobility. AIC padding on the outside of the wrist provides greater protection for the critical wrist joint area over traditional gloves. One model fits both left and right handed batters. DINGR's are sold and priced in complete pairs. B - Premium goatskin leather palm. C - Palm / Bat Interface offers optimal grip. D - Neo Protection covers knuckle area. E - A.I.C. Wrist Protection Insert effectively doubles wrist bone protection.